It has been the bane of countless email marketers as to how to incorporate coupons, coupon codes, bar codes, and other traditionally offline discounts into email. We want these offers and discounts to be easy to redeem and print, but how can it be done? Does the recipient need to be redirected to a separate, print-friendly landing page, or does the email link to a printable PDF? Does the recipient need to write down a code and bring it to a store? Starbucks recently deployed an email with a great solution to this age-old conundrum – they have print functionality within the email itself. When Print This Email is selected, the recipient's default printer displays. Printing is as easy as a simple click. 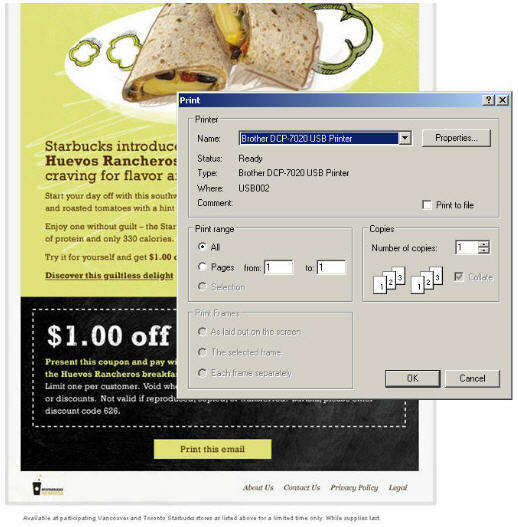 This solution not only makes printing email coupons easy, but also utilizes the subscriber's default printer settings which ensures a clean, readable print.